SuEllen Hamkins, M.D., is a psychiatrist and author. After twelve years as the psychiatrist for Smith College, she is now Assistant Director of the Center for Counseling and Psychological Health at the University of Massachusetts-Amherst and a Clinical Adjunct Assistant Professor at Tufts University School of Medicine. SuEllen is the mother of two young adults, and raising them has been the most thrilling and rewarding work of her life. Aware that the world offers both opportunities and challenges for mothers and girls, SuEllen reached out to other mothers and daughters beginning in her girls' infancies, ultimately becoming one of the founding mothers of the Mother-Daughter Project. Dr. Hamkins has given numerous presentations on girls' and women's mental health for professional and lay audiences around the world, recently focusing on her ground-breaking discoveries about mothers, daughters, their relationships and the kinds of communities that nurture them. 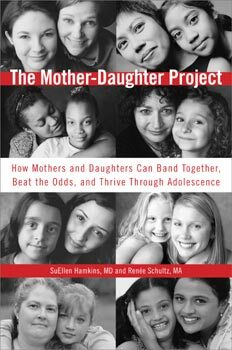 As the psychiatrist for the Smith College Counseling Service from 1992-2004, SuEllen offered consultation to over a thousand women ages 16 to 23 to help them resist and overcome problems such as anorexia, bulimia, depression, anxiety, trauma, assault, and self-injury. Now as a psychiatrist at UMass- Amherst, she offers psychiatric consultation, psychotherapy and supervision, applying the principles of narrative psychiatry which focuses on helping people cultivate their values and strengths in the face of difficulties. After undergraduate studies at Cornell University, SuEllen graduated with honors from the University of Wisconsin Medical School. After her psychiatry residency, SuEllen completed a three-year program in family therapy at The Multi-cultural Family Institute of New Jersey under the supervision of Monica McGoldrick, and was a faculty member there from 1990-1992. 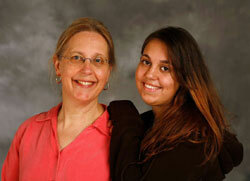 In 1999, SuEllen participated in advanced training in narrative therapy at the Family Institute of Cambridge. In her latest book, The Art of Narrative Psychiatry (Oxford University Press, 2013), SuEllen shares vivid clinical stories about her strengths-based, collaborative approach to psychiatric treatment. SuEllen lives in western Massachusetts, where she loves to swim outdoors, cross country ski, dance, cook, and lounge around in the living room, reading. To see SuEllen speak about parenting issues, click here. Dr. Hamkins is available for speaking engagements through the Penguin Speakers' Bureau. Renée Schultz is the mother of two children, now both young adults. When her son was born with profound medical needs (including Down Syndrome), she quickly became aware that the challenges of motherhood were best met by having an equally involved husband and a community of supportive friends, particularly other mothers. The awareness of the importance of having an involved community crystallized when her daughter was seven and Renée began talking with other mothers about girls, adolescence and their own personal journey into womanhood. Those early talks lead to the formation of The Mother-Daughter Project. Renée has spent the past twenty-plus years juggling work, mothering, nurturing her marriage and friendships, and squeezing in occasional moments of play. Her love of the outdoors and writing have provided sustenance through it all. She lives in Western Massachusetts with her husband and daughter. Shes currently working on several writing projects, including a memoir. Renée has been quietly working in the field of mental health for the past thirty years, beginning with her first job out of college as a counselor for Family Planning, followed by work in a community mental health center and eventually private practice. Influenced by the womens movement, early in her career she joined with other women in developing workshops and groups for women. She is currently working in private practice as a Licensed Marriage and Family Therapist. The primary focus of her work has been and continues to be working with women and couples. In addition Renée has presented internationally on the Mother-Daughter Project. Ms. Schultz is available for speaking engagements through the Penguin Speakers' Bureau.